Last Sunday, I visited the Riverbank Arena at the Olympic Park to watch the Visa International Invitational Hockey Tournament. Even though the cold temperatures made the test event feel more a part of the Winter Olympics, there were still two men’s hockey matches to look forward to. The first match to be played was for the bronze medal of the tournament, between Great Britain and India. There was already a great atmosphere in the crowd as Great Britain’s women had beaten the current World Cup holders Argentina earlier in the day. So, the fans expected more good news and the match against India did not disappoint. The first half was a close encounter. VR Raghunath scored first for India but then the 10,000-strong crowd was lifted just seconds before half time as James Tindall scored the equaliser for Great Britain. The chances continued for both teams in the second half but Rob Moore managed to win the game, as Team GB beat India 2-1. It was a promising third place for Great Britain. With such great home support in the test event, there is every chance of a British Olympic gold medal for both the men and women come July. 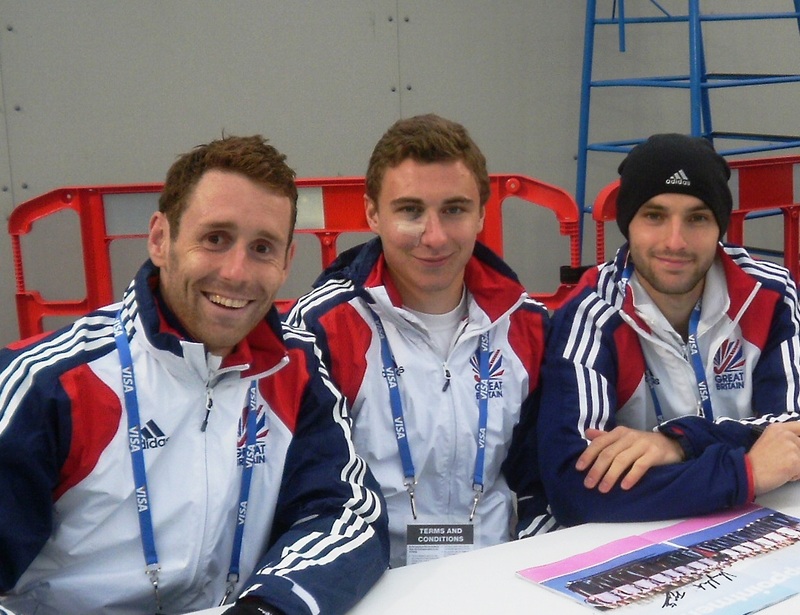 Jonty Clarke, Harry Martin and Nick Catlin of Team GB sign autographs after the match. The final match was also a great spectacle. Australia, the current leader in the world rankings, dominated the first half and so Christopher Ciriello’s goal from a penalty corner came as no surprise. Yet, the Germans equalised soon after and with only a few minutes of the first half remaining Germany took the lead, the score 2-1. 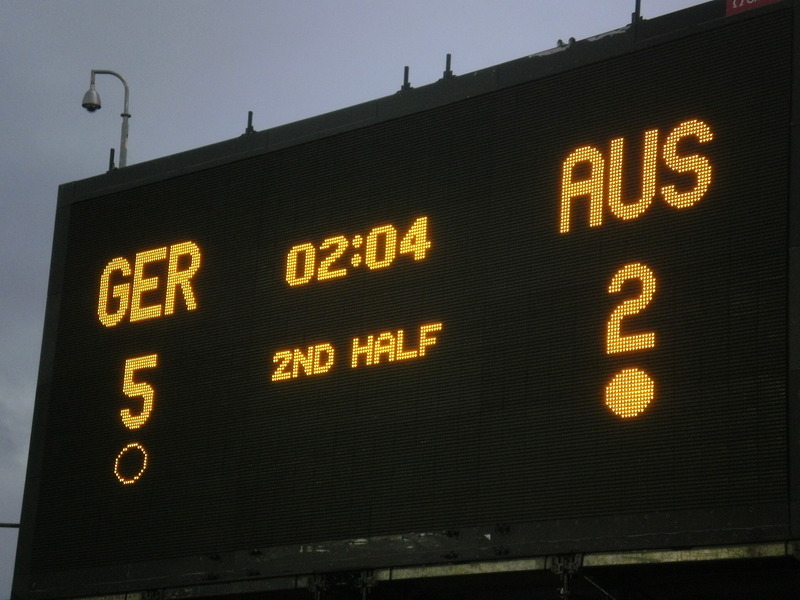 Australia seemed unsettled by Germany early in the second half, as they quickly conceded another goal. However, there were mumblings of a comeback from the crowd after Australia scored their second goal of the game. This was soon dispelled by Germany as they won 5-2 and deservedly finished the match triumphant. Between the two finals there was a special treat for the crowd as past Olympians came together in a parade around the arena. The biggest cheers came when the names of Sean Kerly and Ian Taylor were announced. They were both pivotal in Great Britain’s gold medal winning team in Seoul 1988 . Kerly scored the memorable hat-trick in the semi-final against Australia before Great Britain beat West Germany 3-1 in the final. As well as relieving the past for many of the hockey fans that attended, the parade introduced a new generation of fans to Great Britain’s hockey legends.